Variety can be delicious! For the rabbits and guinea pigs who are true gourmets, these Crispy Sticks for Herbivores from Versele-Laga now come in a tasty multipack! Pamper your pet with these three tasty, oven-baked varieties that are a great dietary supplement alongside their complete daily food. 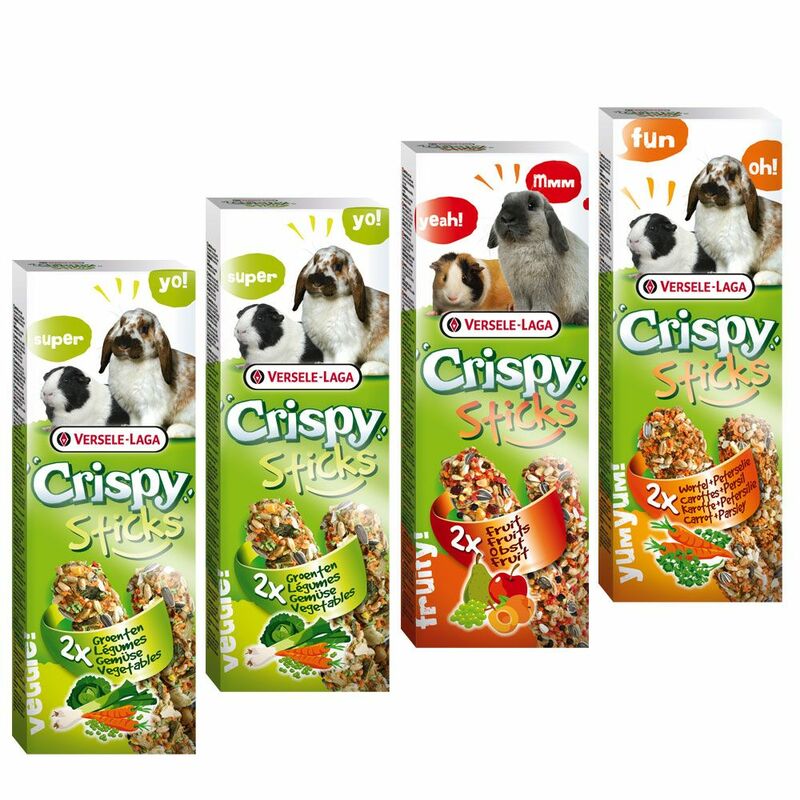 Whichever flavour you pick first - vegetables, fruit or savoury herbs – these Crispy Sticks are a feast and a fun activity for your small animals. And when your pet has nibbled the treat clean, it can still chew and nibble on the willow wood stick. The willow stick is scented and is a real culinary delight! Each nibble stick has a 'Magifix' variable hanging clip, so that it can easily be attached anywhere, to any pen or cage. The Crispy Sticks for Herbivores Mixed Pack also come in 'Fresh Pack' packaging, which keeps the sticks delightfully fresh and preserves the flavour and crunchy texture until you open the packet. Crispy Sticks for Herbivores at a glance: Supplementary feed for rabbits and guinea pigs Multipack in three delicious flavours: 2 x 2 'Vegetable' Sticks, with carrots, peas and leek 1 x 2 'Fruit' Sticks, with apricot, apple, pear, raisins and elderberry 1 x 2 'Carrot and Parsley' Sticks Oven-baked to preserve the natural flavours and valuable nutrients With a 'Magifix' hanging clip: can be fitted on any animal cage or pen Comes in a 'Fresh Pack' packaging.